Tom Petty And The Heartbreakers may have sold millions of records, but there's a lingering perception dating back to the mid '80s that their music is overly broad and too eager to please. Anyone who still spews this viewpoint hasn't paid much attention to the musicians' output over the last five years. On 1989's Full Moon Fever, 1991's Into The Great Wide Open, and the new Wildflowers, Petty, guitarist Mike Campbell, and pals make music that's earthier and ballsier than their early radio-conscious hits like "Breakdown," "Refugee," and "Don't Do Me Like That." While Full Moon and Wildflowers have been listed as Petty solo projects, one of their essential common denominators has been the chiming fills, snarling bends, and overall fretboard finesse of Mike Campbell. An original Heartbreaker, Mike co-produced the LPs, shared songwriting credit with Petty on several songs, and played bass on a few tracks. His primary influence -- Roger McGuinn's ringing chords -- is largely responsible for the Byrdsy quality that has become a Heartbreakers signature. 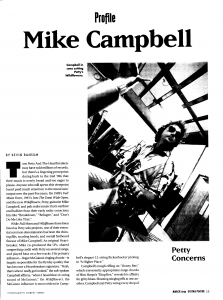 "Yeah, that's when I really got hooked," the soft-spoken Campbell affirms, "when I heard that 12-string sound of McGuinn's." On Wildflowers, the McGuinn influence is most evident in Campbell's elegant 12-string Rickenbacker picking in "A Higher Place." Campbell's rough riffing on "Honey Bee," which irreverently appropriates large chunks of Slim Harpo's "King Bee," reveals his affinity for gritty blues. Shooting stinging riffs at one another, Campbell and Petty wring every drop of grime out of Harpo's signature sound. "Tom wrote this song around this single-note bass-string lick," Campbell explains, "And I just instinctively doubled it, playing it an octave higher on two strings, doing double-stops. On the bridge I came up with sort of a broken arpeggio thing that answered the vocal. Then at the end, me and Tom each take a solo. I was just going for that raw blues, and then Tom took it out with kind of a Chuck Berry-John Lennon thing. It wasn't about technique; it was just about turning the amps up real loud." Campbell describes his role in the Heartbreakers as "fleshing out" Petty's songs. "Tom's a great writer who plays a very powerful rhythm guitar, but he's not a guy who's really studied the guitar neck and knows all the intricacies and voicings. That's what I bring to the music, because I'm a more studied guitarist, although I hate to use that word." But you can hear Campbell's ragged unschooled side in his angular, note-bending break on "Cabin Down Below" and the scalding, melodically nimble solo on Full Moon's "Running Down a Dream" -- one of his few extended in-studio showcases and one of his finest moments on record. "Yeah, I'm really proud of that one," concedes Campbell. "Usually, I don't spend too much time thinking about the solo. We're really more concerned with the song, but we decided to let that one go on longer. So I thought about it a lot in advance, because I really wanted the melody to build and not just be a jerk-off guitar thing." Typically, says Campbell, "Tom's trip is based around his voice against his own rhythm part. He'll bring me a song, and before I even know what the song is, I'll start playing along. And usually before we've reached the chorus or second verse, I've got an understanding of what part will fit against what he's playing. We generally find the essence of the song in the first couple of run-throughs." On Wildflowers, Campbell played his Rick 12-string, the Gibson ES-335 heard on "Honey Bee," and a mid-'60s Stratocaster and Telecaster. Petty typically opts for a Tele, Strat, or Rickenbacker, and they both played Martin acoustics. Campbell generally prefers his Ampeg Rocket amp in the studio, but for Wildflowers, he says, co-producer Rick Rubin "wanted to go with really loud amps, so I mostly used the Vox AC30, plus the Fender Bassman and Fender Deluxe." Campbell is no effects buff. On Wildflowers, he only plugged them in for "Honey Bee." "Just for a laugh," he explains, "I hooked up this low octave pedal, because I wanted that low riff to sound really ugly. Plus, there's a Boss Chorus on there as well. I don't plug in too many pedals, although I probably should. I guess we're usually in too much of a hurry."